My boys love crepes. Truth be told, I love them as well. 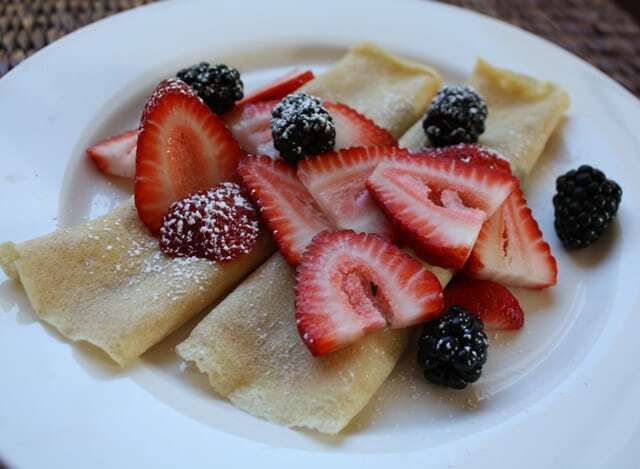 We had a lot of fresh fruit in the fridge and I was curious to see how crepes would taste when made with whole wheat flour. I was impressed with the flavor. The crepes were not at all dry and the whole wheat flavor was barely discernible. These were a hit with all three of my boys. I love that they enjoyed these as much as some of our sweeter breakfasts and it was still a big treat for them! I bought a crepe pan recently and have been dying to use it! These look so easy and super yummy! I will be giving them a try for sure! Thanks. These were fabulous! I had to halve the recipe, but it was still delicious. 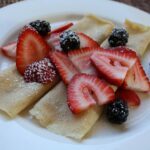 For anyone who's afraid of crepes - don't be! I'm convinced that anything you smother in powdered sugar and butter is impossible to mess up! How wonderful to have a whole wheat version! Thanks Mary!